19" Embroidered Christmas Stocking Tree Bears Design in applique.. Back is suede velvet, inside is lined with satin fabric. 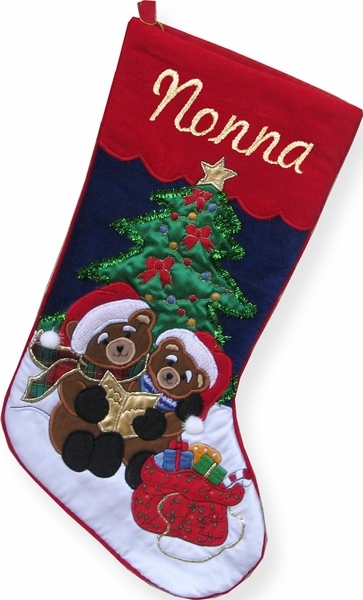 This stocking is very well made in detailed embroidery applique and is sure to be heirloom in the family for many years. Measured along the diagonal from the top left hand corner to the toe, the stocking measures 19 inches, and the width along the cuff is 8 inches. Materials: The stocking is made from deep blue, red and white sueded velvets with applique embroidery. The inside lining is from polyester satin material. We carry similar designs as pictured in the additional image so you can make a set!